Every once in a while Chanukah and Christmas arrive at the same time. This year is not one of those times. Hanuka is early this year, about a month before Christmas. This brings to mind a frayed Jewish joke: When is Hanukah this year? It is the 25th of Kislev; the same time it is every year. Hannukah gets the plaudits in our home, being Jewish after all. When I was growing up, there were dreidels, candles with a special candelabra, and milk chocolate foil-covered coins. One game involves spinning the dreidel, which is a four-sided top. Each side of the dreidel has a different letter for the words A Great Miracle Happened Here (in Hebrew, you get by with four words). Each of these letters represents a different value as we spin the top and gamble our coins. If there are kids, we may still play; but as adults, the real action is in the kitchen with a feast of crispy potato pancakes, called latkes. Any food that is fried in oil would work for Hanukkah—French fries, jelly doughnuts, fried fish. It is the oil that is important, as this holiday commemorates the miracle of a day’s worth of oil lasting eight days when the temple was reconsecrated, more than 2,000 years ago. There are as many traditions for Chanukkah as there are ways of spelling it. For fun, Google “ways to spell the Feast of Lights.” Chanuqa anyone? This drives proofreaders nuts, as there may not be a wrong way to spell it. The advantage of separating what is admittedly a fun but minor Jewish festival from Christmas, is that there are so many good things to eat. Celina makes a sensational traditional Christmas pastry, lighter-than-air Chursciki—sometimes called angel wings—from thinly rolled fried dough dusted with powdered sugar. Since they are fried, they work equally well for Chanuka. However, my favourite is that old (and the older the better) standby, the Christmas fruitcake. For some, fruitcake has a bad rep but, frankly, I don’t think that I ever met a fruitcake I didn’t like. If it is stale, add rum or brandy and wait a day or so. I even enjoy the rather bland Kiwanis versions charitably consumed at this time of year. I think of it as fruitcake-light. The fruitcake has a noble lineage, with recipes dating back to medieval Europe when dried fruits were first shipped from the Mediterranean to England. Tasty, preserved and nutritious, these were mixed with nuts, aromatics and spices, sugar, eggs and (after the church decided that it wasn’t sinful) butter, and just enough flour to hold everything together. It is baked at a low temperature for a several of hours, cooled and packed off to mature. Every couple of weeks, for at least month or two, brandy is drizzled spoonful-by-spoonful over the cake to both preserve it and keep it moist. 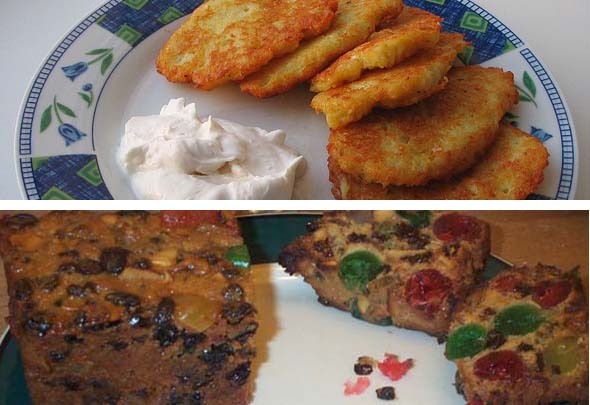 Perhaps these two foods exemplify differences between the religions, although I leave that to philosophers and anthropologists: stolid, methodical Christian fruitcake and get-’em-while-they-are-hot-and-crispy Jewish latkes. 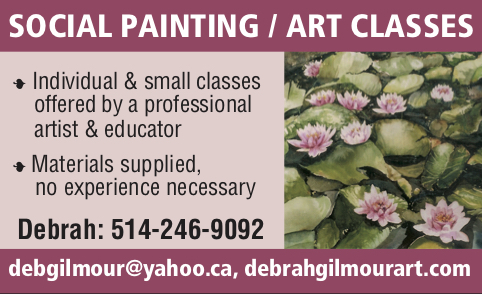 Living in a tolerant multicultural society, I appreciate having both. Here is how we make latkes: Celina goes into the kitchen. Everyone else leaves, drinks wine, plays the dreidel, tries to remember Chanukkah songs … an hour later she says, “Come and get ’em!” This is just about enough for a dozen serious latkes lovers. In several batches, wash, peel and grate 5 pounds of potatoes and 4 medium onions in a food processor, adding juice from one lemon. Reprocess with a chopping blade until this is finely chopped. Drain it well in a large strainer, pressing out the water. Mix the mash with 4 eggs, 3/4 cup of flour, a tablespoon of salt and a teaspoon or so of ground pepper. All of this can be done a few hours before. When you are ready to make them, heat a large cast-iron frying pan, a wok or casserole on a medium flame. Pour in a half-inch of oil and heat this to about 350F (175C) or until a small dollop of the mix fries. Taste this, adding more salt and pepper if needed. Use a tablespoon to drop the mash into the pan and flatten it with the back of the spoon. Fry the potato pancakes until crispy, adding more oil as necessary. Drain them on paper towels and serve them right away. 5 Comments on "Flavour Guy: Latkes vs. fruitcakes, and the winner is … me"
Thank you for the Latkes recipe – we’ll try it! חנוכה שמח! Fun. A small clarification: it’s only in Israel that the letters on the four sides of the dreidl stand for the Hebrew for A Great Miracle Happened Here. (To believers, it did, after all, happen in that part of the world.) Elsewhere, the letters on the dreidl stand for A Great Miracle Happened There. Nes gadol haya sham. Of course, you are right. Po = here; sham = there. Have to check ours! In our home hand grated potatoes score more points than using a processor. The latkes have a courser texture and tend to crisp up better.